These claims need unpicking, because they conceal the reality that after nearly 5 years of ConDem government, NHS finances are about to “hit the buffers” – according to the Chief Economist at the Health Foundation. A recent Commonwealth Fund report identified the NHS as the most effective and cost-efficient health service in the world. It flagged up the fact that the still largely publicly-owned and run (nationalised) NHS beats private health care systems hands down. So it effectively serves as a warning against the galloping NHS privatisation set up by the Health and Social Care Act 2012 . If unchecked, this will transform the NHS into exactly the type of costly, ineffective private health service that it currently outperforms. Apparently oblivious to the damage they’ve done to the NHS, ConDems are spurting high level figures about the government’s “extra investment” in the NHS, increases in operations and in numbers of doctors and nurses. In a letter to me explaining why he didn’t support the 2015 NHS Reinstatement Bill, Calder Valley MP Craig Whittaker said the ConDems had made an extra £12.7bn investment in the NHS. This claim disguises the fact that NHS funding since 2010 has been flat. It has not kept pace with population growth and rising demand for NHS services – caused by growing numbers of people with one or more long term illnesses, along with other factors. According to the Foundation Trusts Network, demand for NHS care is rising by 4% a year – in the first three months of financial year 2014/15, for example, hospital emergency admissions were up by 4% and the most urgent ambulance journeys by 7%. This flat funding combined with a 4% increase in demand for NHS care has opened up the prospect of a £30bn NHS funding gap by 2020/21. NHS England issued a Call to Action in the summer of 2013 when this funding gap was identified, basically calling for NHS cost cutting. This is a big driver behind the Calderdale NHS plans to cut acute services and put community NHS services out to competitive tender, under the NHS and social care “transformation” scheme known as Right Care Right Place Right Time – now rebranded as Care Closer to Home because the public didn’t take too kindly to Right Care. These plans are already being carried out – without any public consultation. And even before these plans are carried out, NHS England’s “Call to Action” cuts are already biting hard on the NHS as the government has demanded greatly increased “efficiency” savings, starting this year. As a result we are looking at a tidal wave of hospitals ending this financial year in deficit. Including our own in Calderdale and Huddersfield. This will put Foundation Trusts in breach of their licence to operate, meaning that Monitor can send in the special administrators to decide which services have to go on being provided and which can be cut. Monitor has highlighted that even if every efficiency gain and new model of care is delivered, there would still be an overall gap of £7 billion at national level by 2020. 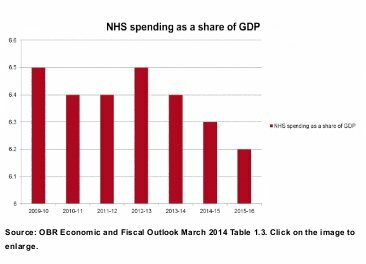 NHS funding as a proportion of GDP has fallen in 2014-15 compared to 2009-10 and is on track to fall still further, unless there is a significant increase in NHS funding next year. Acute hospitals are not the only bit of the NHS that are feeling the pressure of inadequate NHS funding. By March 2014, specialised services like chemotherapy and cystic fibrosis care, that are commissioned by NHS England, had overspent by £366m (3.8%) in the first nine months of 2013. Extra NHS funding from the government of around £4-5bn/year (a 4% increase each year) is needed to fill the £30bn “funding gap” predicted for 2020/21. This amount could be provided by ending NHS marketisation/privatisation, since at the most conservative estimate, the costs associated with this amount to at least $4.5bn/year. The 2015 NHS Reinstatement bill would end NHS marketisation/privatisation, so freeing up the money needed to sustain current levels of care in the NHS. Without this 4% funding increase, the Foundation Trust Network says that care will have to be cut. Both Craig Whittaker MP and the LibDem Calderdale Council James Baker point out that there are more clinical staff in the NHS than there were in 2010. For example, in his letter to me about why he doesn’t support the 2015 NHS Reinstatement Bill, Craig Whittaker said that there are over 6,500 more doctors and over 3,700 more nurses in the NHS than there were in 2010. But although high level figures show a (historically small) increase in NHS clinical staff numbers since 2010, this is in the context of a growing population and rising demand for NHS services. NHS staff report that this increase in their numbers has not been enough to keep pace with growing demand in the NHS, and that patient care has suffered as a result. These high level figures also only really make sense when disaggregated, because, for example, they conceal the fact that although the number of nurses has increased, there has been a massive cut in the numbers of senior nurses at bands 7 and 8, and in community nurses. The ConDem government’s increase in NHS staff is lower than historical rates of NHS staff increases, particularly for hospital doctors. For example, the Health and Social Care Information Centre (HSCIC) 2013 census of NHS staff, published in March 2014, shows that in 2013 the number of FTE Hospital and Community Health Service Medical and Dental Staff increased by 1.7% since 2012. This compares to an average annual increase of 3.6% since 2003. For community nurses, HSCIC workforce data for December 2013 showed a decline in overall NHS community nursing since 2009, falling from 48,108 in September 2009 to 45,943 in October 2013, a drop of 4.5%. FTE qualified nurses (Excluding GP practice nurses), an increase of 2,632 (0.9%) since 2012 compared to an average annual increase of 1.0% since 2003. But although staffing figures for nurses don’t look so bad, they mask large cuts to numbers of senior, experienced nurses in Band 7 and Band 8. In response to their Freedom of Information requests to hospital trusts, the Royal College of Nursing found in March 2014 that although official statistics show there were 4,500 more nurses on wards than in May 2010, since April 2010 3,993 full-time equivalent (FTE) senior nursing posts in bands seven and eight had been lost. And in July 2014 – following a rise in numbers of nurses in 2013, after the Francis Report warned that additional nurses were needed in order to protect patient safety – the HSCIC provisional workforce figures showed a decline in the overall number of NHS nurses for four consecutive months, with a combined loss of 1,929 workers since March. The Nursing Times reported on 4/11/2014 that while overall nurse numbers have climbed by 6,000 over the past 12 months, many wards around the country remain short-staffed after deep cuts made in recent years due to financial pressures. The moral of this story? Statistics are only as truthful as the people manipulating them. This entry was posted in Social fairness and tagged Coalition Government, ConDems, NHS funding, NHS staffing levels by jenny. Bookmark the permalink. The last set of published accounts for Calderdale and Huddersfield NHS trust for 2013/14 show an operating surplus of £642,000 for the year, and an increase in income of £353,274,000 for 2013/14 from £351,314,000 in 2012/13. Figures published by the HSCIC show there have been 13,635 more clinical staff in the NHS than in may 2010, including 7,997 more doctors. The point about spending as a percentage of GDP is a reasonable one to make, the other major point is that health care inflation is high, and new science and technology creates increasing demand for treatments for and aging population. As a local ‘ConDem’ I actually support increasing Health expenditure as a percentage of our GDP. The increasing need for NHS spending is why Norman Lamb MP has called for an extra £1.5Bn to be freed up in the Autumn statement for the NHS. The Liberal Democrats want some of the extra funding to focus on improving mental health care particularly for children and young people, a key priority for the party.